Sometimes you feel it is just one big struggle and a never ending battle to keep your head above water. I've thrown my hands up in despair and cried out to God to please, please make a way. and somehow God gave me the strength to "keep on keeping on". Encourage your husband and thank him for working so hard for your little family. Stay away from "doom-sayers" - those who constantly tell you "how difficult things are for you" or that "you'll never make it" etc. Remain thankful and remind yourself rather of all that you have (your Faith, health, husband, children, friendships etc.) instead of focusing on what you don't have. Take a deep breath and take time off "worrying". Instead have some frugal fun and enjoy your family and the time spent together. 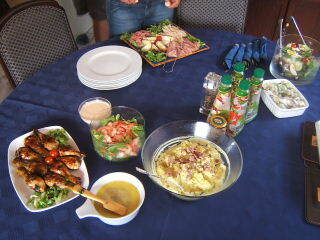 Have a "bring and share" dinner at your house, a DVD and Popcorn evening or a games evening. Laughter and good friends can really help lift your Spirits. A "bring and share" in essence is when everyone contributes to the meal by bringing something that can be shared with everyone - for example one person will bring a salad, another a potato dish and another will bring a dessert . Usually when we have a barbeque, everyone must bring their own meat and drinks as well (enough for their family). Knowing I have helped ease someone else's burden definitely makes me look at my own problems in a different light. Include your children and teach them the valuable lesson of caring for others without expecting anything in return. A burden shared is halved. I have an older friend that I often speak to about my concerns and her years of life experience has often helped me put things in perspective and has lightened my burdens. Spending time in the garden is very therapeutic for me...it somehow has a calming effect on me. and it can help return calm and tranquility to your state of mind. Allow yourself time on your own. Apart from reading my Bible and praying in the morning, I try to spend one Saturday every six weeks or so by myself. colour my hair , give myself a Manicure and Pedicure and if time allows a Facial ( steam, home-made face scrub and home-made facemask ). My sister-in-law calls this a "pink pig" day. My "pink pig" day usually lasts from 9am to 1pm while my hubby looks after the kids for me. Make time for the two of you. Go away for a weekend once or twice a year. It doesn't have to cost much. The Frugal way would be to ask your Mom and Dad to stay at your house and look after the kids while you stay over at their house. I really want to encourage you to "keep on keeping on". Stay on your knees and keep your chin up. ... Subscribe to my FREE monthly E-zine. 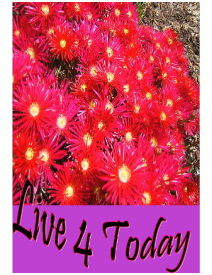 "Live 4 Today" is a FREE e-zine that provides you with encouragement, recipes, reminders and frugal tips. 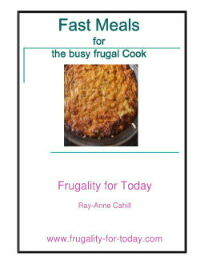 You will also receive free access to my Frugal living printables and copy of my e-book "Fast Meals for the busy Frugal Cook". I promise to use it only to send you Live 4 Today. Important: A confirmation email will be sent to the email address provided and once you confirm your subscription, we will send you the password which will give you access to the printables webpage. To view back issues of my free monthly e-zine, visit the back issues page.